The EZ Lite Cruiser Deluxe DX10 (HD) Heavy Duty is the newest addition to our product line. It is composed of a very durable lightweight aluminum alloy, giving it a total weight of only 55.7 pounds, but being able to handle passengers weighing up to 330 pounds. This model has 10" rear wheels, with powerful 2 x 250 Watt Brushless HUB Motors, and is wider in the seating area than our Standard model. The Heavy Duty Model also folds and unfolds very quickly and easily. Even with it's rugged rear wheels, it still folds to a small compact space. With it's Tall 19.5" semi recline back, once you sit on the EZ Lite Cruiser you will know it is extremely durable and you will enjoy every minute of driving it. Your purchase includes everything you need to use it -- comes with the Battery, Charger and the Joystick. 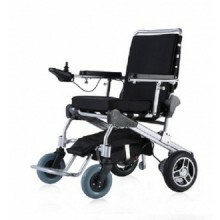 Click the button below to add the EZ Lite Cruiser DX10 Power Chair to your wish list.